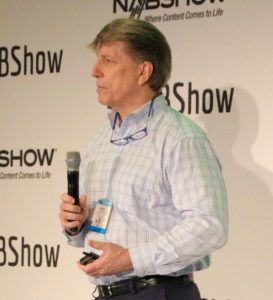 LAS VEGAS — Alex Nauda, CTO for video collaboration firm SHIFT and Screeners.com, sees the big hacks and malware infections getting all the attention when it comes to the content security space today. 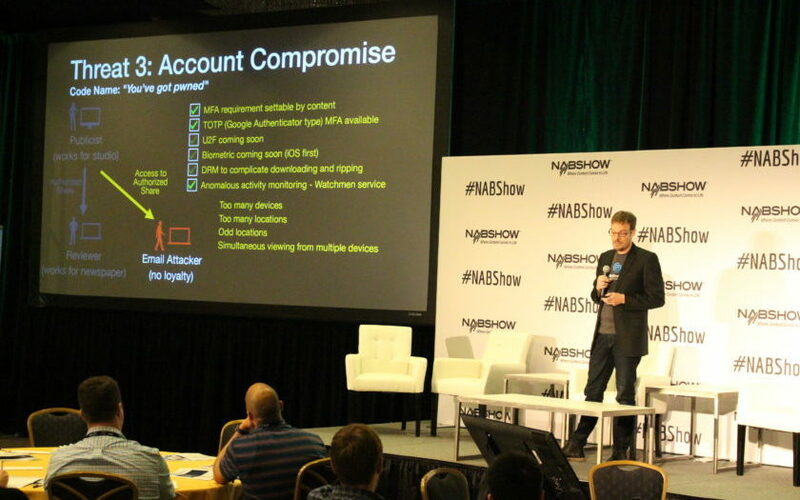 So he used his time at the April 7 Cybersecurity & Content Protection Summit at the NAB Show to talk about the more mundane problems out there. “The challenge is that potentially dangerous activity — such as sharing one user login among multiple people — can often masquerade as normal authorized use,” he said, sharing three threats that can have just as much impact on your intellectual property has any hack out there. “The Lover” — sees an unauthorized person gaining access to pre-release content via authorized distribution. A publicist sends a film reviewer a legitimate screener, but that reviewer then shares the content with someone close to them, who then proceeds to download or share it elsewhere. Another “mundane” threat is “The Stale iPad,” where a device that’s still logged in, thanks to saved passwords, is accessible by someone who is not the authorized user. They get the content, have no loyalty to the content owner, and are then capable of causing untold amounts of damage. Lastly, there’s the “You’ve got pwned” threat, where an unauthorized user compromises the email account of an authorized user. That one may be the most problematic, Nauda said, because biometrics might be the only way to fully prevent that unauthorized access. By modernizing security frameworks and controls, responding to a global security skills shortage, addressing increasing cyberattack vectors (including IoT), and securing the company’s journey to cloud and digital transformation, IBM Security was able to help the Weather Company address nearly every aspect of cybersecurity. “One of the most powerful things we’ve come to understand is that every client is on their own unique security journey,” he said. “Though every clients journey is different, some are putting the final touches on their maturity program, while some are just getting started, one thing is common… they all want to improve their security program.